[Photo essay] Painting a crumbling death-trap-waiting-to-happen shatters the absurdity meter in my brain. I'm discovering that I'm not really a true and objective photo essayist when it comes to refraining from putting in my own two cents about the images I've captured with my Canon camera recently. Purists be warned: I'm not about to reform anytime soon. 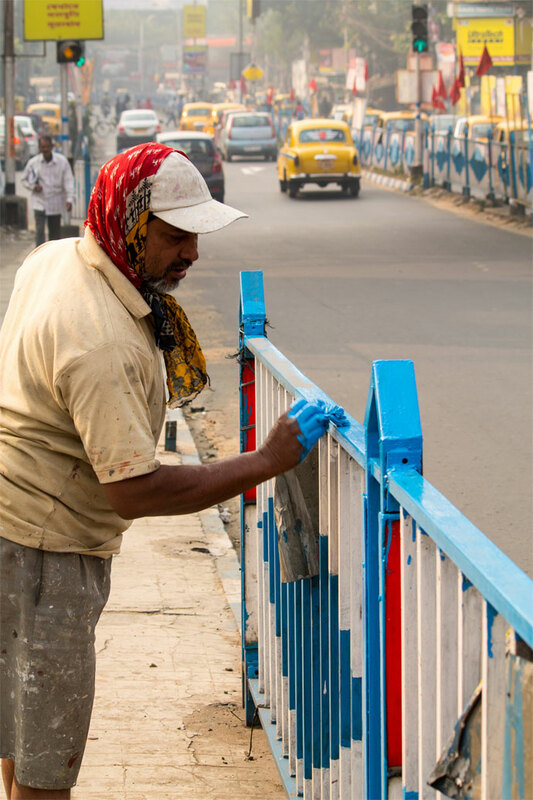 If you would have walked with me over the Dhakuria Bridge over the last two weeks of 2015 in Kolkata, you'd know why. There's something about the government painting a crumbling death-trap-waiting-to-happen blue and white (and pretending all is well) that really shatters the absurdity meter in my brain. And as a fan of Monty Python, Douglas Adams, Kurt Vonnegut, and American democracy, I like to think I have a very high tolerance of absurdity. 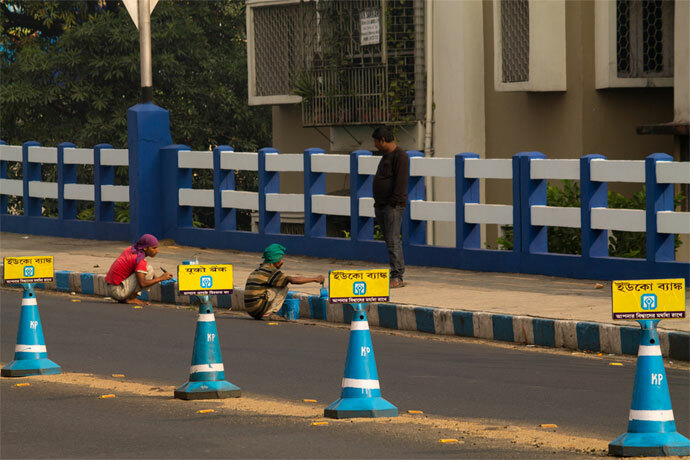 So for the sake of objectivity, let's look at the positive impact of this bridge-painting project, which is part of a city-wide beautification initiative set into motion by Chief Minister Mamata Banerjee a few years back. Some people think the colour combination is pretty. You won't have to search YouTube very long to confirm. 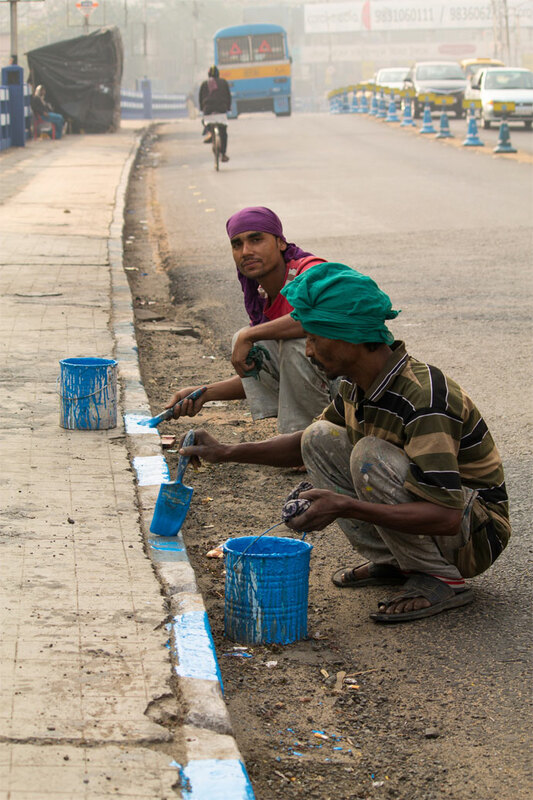 Also, the labourers employed to do the painting may not have other employment opportunities if this ongoing project did not exist. But this is where all the pros for the endeavor seem to end short of some creative speculation. As for the cons, let us agree (if it is objectively pleasing to do so at this time!) 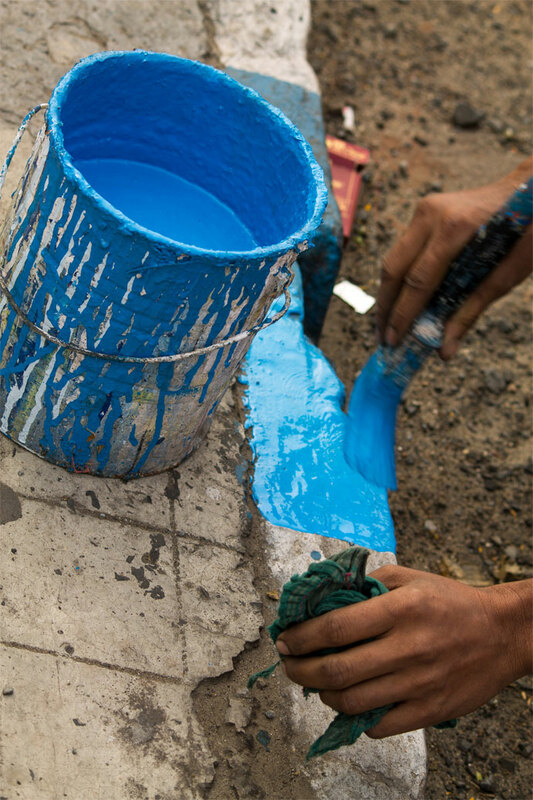 that painting a crooked, crumbling, sloping curb blue and white along the fault lines of a lumpy, meandering, and unstable road, is akin to custom-ordering a wedding gown for a pig. 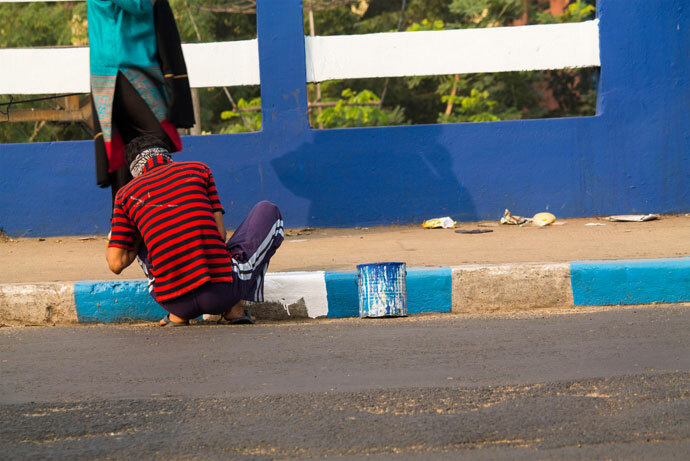 Most of the men I saw painting were using wooden sticks or brushes to do the job. But a couple of them seemed to prefer using their hands for some of the work. Whether by choice or from lack of tools, I do not know. I decided after observing a couple cases of finger-painting that I'd get a shot of the cans to see if I could investigate what chemicals were in the paint. But all of the cans were well slopped-over with colour. I am aware that as a foreigner-outsider, I really don't have the credibility of a native to speak up on such issues, especially when my own country has its own lion's share of problems with mass infrastructure failure. 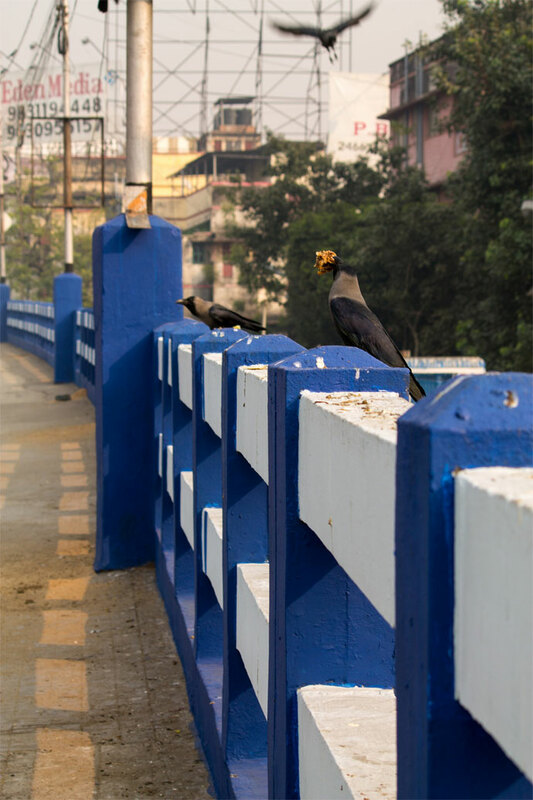 I can only offer one absurd solution, given what I've witnessed and photographed at Dhakuria Bridge, that could cut some costs on the white paint: Feed the crows strategically.